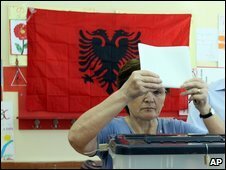 Albania's Prime Minister, Sali Berisha, has taken a clear lead in exit polls for Albania's general election, as the official count continues. But both Mr Berisha and his main opponent, Edi Rama, urged people to wait for the official result, which has been delayed and is expected this week. Election observers said the vote showed a marked improvement on previous polls, though there were still some concerns. Sunday's vote is being seen as a test of the nation's democratic credentials. Albania joined Nato earlier this year and has filed for EU membership. As exit polls showed him in the lead, Mr Berisha said: "I call on Albanians to follow the results [of the ballot count] with maturity, without evoking ideas of those triumphing or those losing." Even so, hundreds of Berisha supporters took to the streets, honking car horns in celebration. Mr Rama, the Socialist mayor of the capital, Tirana, also warned that "the real result is still in the ballot boxes, patience is needed". And his party said it intended to complain about election irregularities. "We have seen cases of intimidation of voters by the people from the Democratic party and problems with voter registers," a party official said. Hundreds of international observers monitored the vote to avoid any repeat of problems seen in previous polls, which have been marred by violence. The OSCE, Europe's human rights and security watchdog, said on Monday: "Election day was overall calm and peaceful and the atmosphere was improved [compared to previous elections]." It said new voter registration and identification procedures were a great improvement, but that public confidence had been undermined by "the politicisation of technical aspects of the process and violations observed during the campaign". Brussels has called for a free and fair poll if Albania is to move further towards EU integration. Both main candidates have promised to bring Albania into the EU. A range of issues have been raised during the campaign but surveys show that the economy is uppermost in voters' concerns, the BBC's Mark Lowen in Tirana says. After more than 45 years of isolation under Communist rule, the country's economy has slowly rebuilt itself. Albania has not been as hard-hit by the global recession as many European countries but is still expecting a sharp drop in annual growth, our correspondent adds.